Tonight was your Wednesday Demo. get together, and I really needed this one. How cool is it when "work" is the relaxation with friends that you desparately need? I am so lucky to be able to call Stampin' Up! work!! Yvonne joined our demo group tonight for the first time, and this is the card she shared with us as her shoe box. 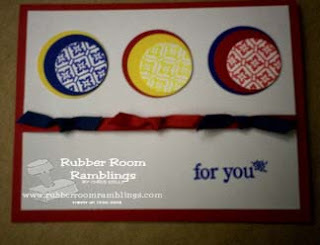 She used the new Circle Circus stamp set with Bold Bright colors (Brilliant Blue, Yo-Yo Yellow and Real Red). This was such an easy card to put together, but I totally love the results. I am certain to use this in an upcoming class/workshop. Thank you so much, Yvonne, for your inspiration!